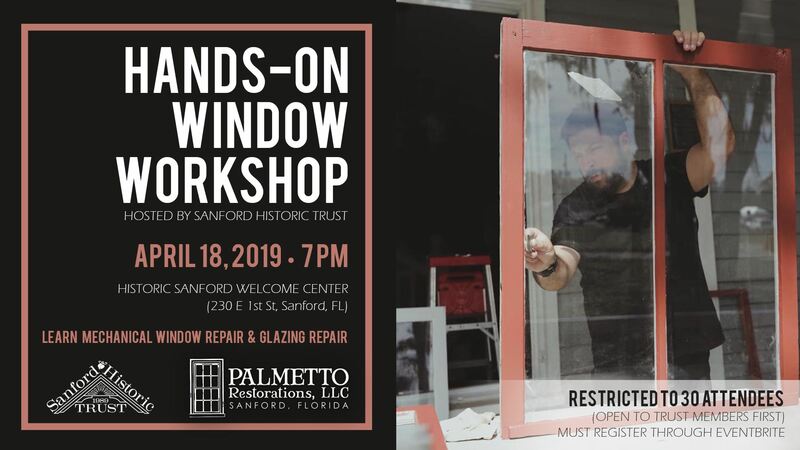 Palmetto Restorations Fl has partnered with the Sanford Historic Trust to bring you the Historic Preservation - Window Restoration Workshop. A brief trust membership meeting will be held at 7:00PM which will include updates on our Preservation Awards in May, our Calendar Project, the Civic Center to become a Historic Landmark, our lamppost project, a reminder about our community picnic, and other items as well! Afterwards participants will work side by side with Jeb Agnini, owner of Palmetto Restorations, LLC, who will guide them through the steps involved in restoring historic windows, including accessing trap doors, retying sash cord, and glazing and painting techniques. Participants should wear clothing appropriate for the activity; close-toed shoes are encouraged. The event is FREE but space is limited to 30 people. Click the link below to reserve your tickets. CALENDAR ADVERTISING SPOTS ARE NOW AVAILABLE! Please click here for pricing: Calendar_Sponsorship Pkg_rev4. Was a great success, thanks to all who participate. For photos of previous Harvest Moon Dinners, check our Harvest Moon Dinner page. Your membership will help the Sanford Historic Trust achieve its mission for years to come. Please accept our heartfelt thanks for your generosity and commitment to the Sanford Historic Trust. Please tell your friends and neighbors about the Trust and encourage them to join today! Your membership may be tax deductible.